Alligator Lake | Florida Hikes! 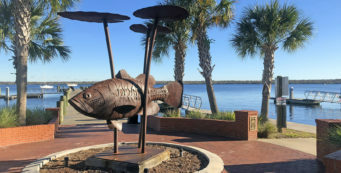 In the city once called Alligator, first home of the University of Florida and named for a great chief of the Seminoles, Alligator Lake has long been a gathering place. 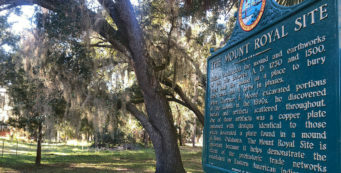 South of downtown, restored from agricultural land to wetlands, this county park opened in 2002 with hiking as its primary recreational focus. 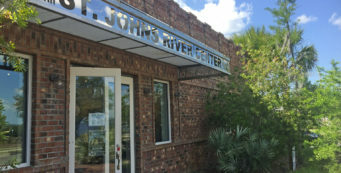 Visitors can also enjoy the picnic area and playground, or launch a canoe or kayak into the wetlands for a close-up view of heron rookeries, but the big deal is the extensive network of hiking trails. Some start just behind the restrooms and playground, and offer short walks through the forest along the east side of the park. The longest loop, however, is the Montgomery Trail, that starts down at the canoe launch, and circles the impoundments along the lake. The park is closed Tue, open Wed-Mon, 8am to 6pm (or 7 pm during daylight savings time) and offers other recreational activities, such as canoeing and bicycling, fishing and picnicking. 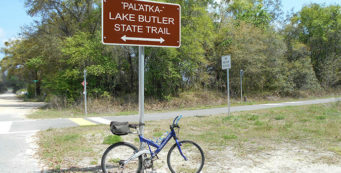 Some trails are shared with bicycles. 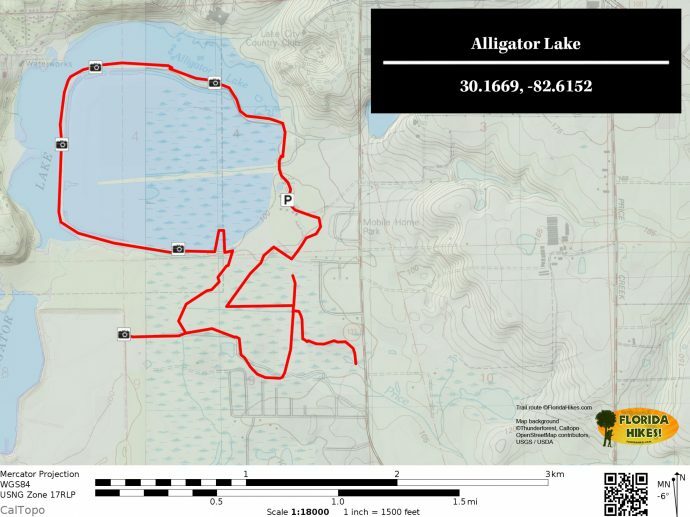 To find the Alligator Lake Recreation Area, take I-75 exit 427, Lake City. Follow US 90 east for 2.4 miles to SW Baya Drive (SR 10A). Turn right. Follow Baya Drive for 2.6 miles, crossing US 41 and US 441 before you reach the traffic light at SE Country Club Road. Turn right and drive 1.2 miles to the park entrance, on the right. The footpath leads through an overgrown meadow, steering you to the shade of the live oaks. Spoil piles rise to the right, cutting off your view of an open pasture. 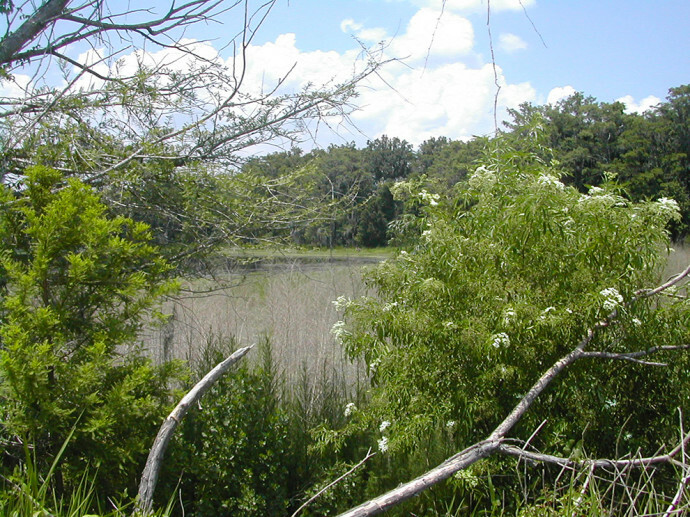 To the left is a broad expanse of marsh—the crowning achievement of this preserve, turning the open fields back into their natural habitat. Watch carefully, and you’ll see great blue herons poking through the shallows, green herons preening themselves, and snowy egrets fussing over snails. Following the white arrow on a green background, you turn left onto a dike. To explore the Possum Trot Trail, turn right. The trail winds through a grassy meadow, following a jeep road. The Eagle Trail comes in from the left. You can follow it atop a low dike, or continue straight ahead to find the Capybara Trail, which parallels Price Creek at the south end of the park. To the right, it follows the creek to where the creek spills into the cypress swamp. 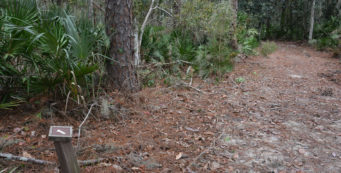 To the left, it’s a shady path that becomes a dike between the creek and cypress floodplain. The Capybara Trail turns off the dike and drops into a small open prairie. At the far end of the prairie, you reach a trail junction at 4.2 miles. Along the Willow Pond TrailA side trail to the right leads to Willow Pond, a wonderful walk in fall and winter for the colorful red maples and sweetgum growing along a slough. The trail ends abruptly, so you need to turn back. Reaching the Capybara Trail again, you can go straight ahead to the Eagle Trail, or turn right. If you follow the Eagle Trail, it leads to the Deer Trail, another walk through a meadow. Both the Montgomery Trail and this maze of shorter trails eventually lead to the Bobcat Trail, which will loop you around to the entrance area. Another side trail, the Old Canal Trail, offers a walk paralleling the entrance road, but you can follow the Bobcat Trail back around to the parking area to finish a big loop of 6 miles (Montgomery > Possum Trot > Capybara > Eagle > Deer > Bobcat) or a shorter loop of Montgomery > Bobcat, for about 4 miles.